The Copse is thrilled to introduce their new Psychologist, Matthew Dicks. 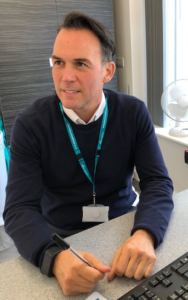 Matthew completed his Clinical Psychology training in 2002 at Birmingham University and has since gained experience in various areas including complex trauma, mental health, acquired brain injury and addictions (alcohol and drugs). His rehabilitation/ therapy skills include the mental health Recovery Model, DBT, CBT and ACT (Acceptance Commitment Therapy). He is certificated in EMDR and has trained in Mindfulness at the Oxford Mindfulness Centre and Bangor University. Matthew uses motivational interviewing in order to engage the service user and this ensures strong outcomes. The Copse incorporates both group and 1:1 work as part of its recovery programme for the service user, ensuring that any drug and/or alcohol issue is part of their programme on site, always with an objective of ‘positive discharge’. At The Copse we have 24 bedrooms arranged in 4 small units with each unit offering a therapeutic environment. The Copse is situated in a residential cul-de-sac, providing easy access to activities in the wider community. Meaningful activities, including daily living skills and education and vocational opportunities are key to a patient’s daily routine. We work together with our patients to build their confidence and skills so they can re-join a meaningful place in the community, or just as often, start afresh. We’d like to welcome Matthew to Elysium Healthcare, and if you would like any further information on our drug and alcohol programme at The Copse, please contact our Hospital Director Charity Dube.